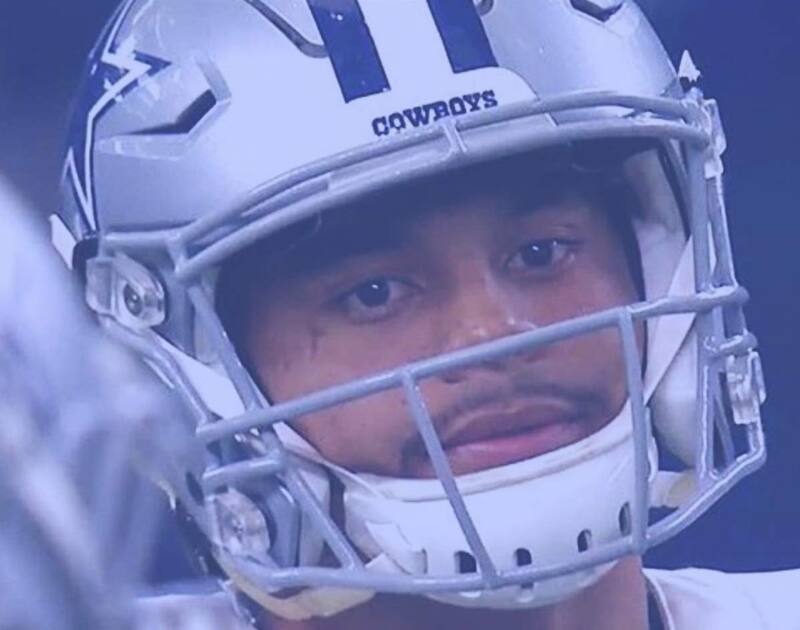 So Long As The Cowboys Win One Or Both Of Their Last Two Games, No One Will Care That They Got Shut Out By The Indianapolis Colts In Week 15. On Sunday, Dallas Cowboys played the Indianapolis Colts at Lucas Oil Stadium for the first time since 2010. There was a decent amount on the line, too, including a chance to lock up an NFC East title and a guaranteed home game in the playoffs — all this with two weeks remaining in the regular season, no less. But things didn’t exactly go so great up in Indy on Sunday. Riding high and heading into this Week 15 match-up on a five-game win streak, the Cowboys came out swinging in this one, registering extended opening drives of 10 plays, 15 plays and 14 plays. But not once did those efforts amount to points being put up on the board. In fact, things would continue playing out that way all game long, as the Cowboys would eventually lose this one 23-0. No, it wasn’t anything to write home about. Fortunately, this mostly forgettable game was a game the Cowboys — even with rivals the Washington Redskins and Philadelphia pulling out improbably Week 15 wins — could stand to lose without hurting themselves too much. That’s just something you wish the players hadn’t noticed themselves, y’know? Everywhere you looked — from a missed touchdown connection between quarterback Dak Prescott and fullback Jamize Olawale and an Ezekiel Elliott fumble to a blocked field goal and a surprisingly stagnant defense — the Cowboys just did not look up to snuff on Sunday. Could that maybe be a good thing? Sure. Banking on this team winning 11 or 12 games in a row was definitely a stretch. So, without a doubt, it was better to see this team take an L and put forth a lackluster effort now instead of during the playoffs. But to go out and not score any points — the first time that’s happened for this Cowboys team since 2003 — against a Colts team that is on the outside looking in of the AFC playoff picture? I can’t imagine many of us saw that coming. Alas, a stinker is what we all got. The Cowboys just looked obsolete — on all fronts. The defense, which has shown all year that it can be a dominant force, barely looked as if it looked its hotel on Sunday. The amount of missed tackles that this unit had over the course of Sunday’s game should be illegal. Even when it looked like the Cowboys’ defense had Colts ball-carriers dead to rights, the Dallas defenders would simply whiff on the tackle. In turn, the defense allowed Marlon Mack to become just the second opposing running back to register 100 yards on the ground against them this season. Perhaps even more shocking? Andrew Luck stayed upright the entire game. No, this defense was just not capable of getting stops, turnovers, sacks or hurries against this Colts Unit. Maybe this loss, which makes the Cowboys 1-3 on the season against the AFC South, is the type that the coaching staff and front office could use as fuel to ignite whatever fire is needed for this team to go on another winning streak? Maybe. It’s certainly already got them exploring their own options, as they’re apparently taking a long, hard look at bringing old friend Barry Church back into the fold after he was released by the Jacksonville Jaguars late last week. He’d certainly be a cheap signing, and one imagines it wouldn’t take long for him to get back into the swing of things on this defense after having left Dallas after his 2016 campaign. He’d make for some nice added depth at the least. It’s also possible that the day was made hard because of one key cog on the Indy sidelines: Matt Eberflus. After working as the Cowboys’ linebackers coach and passing game coordinator under Rod Marinelli in 2016 and 2017, Eberflus’ is now in his first season as an NFL defensive coordinator with the Colts. Gotta figure he still remembers a few of the offensive principles favored by his old coworker, Cowboys offensive coordinator Scott Linehan, right? Eberflus’ young defense certainly had Prescott working hard on Sunday, with his the number of times he’s been sacked on the season now rising to a whopping 52 times. With Zack Martin out rehabbing his hurt knee, the Cowboys offensive line didn’t do Prescott any favors. A banged-up Tyron Smith continued looking rocky, and backup guard Xavier Su’a-Filo eventually left game himself with an eye injury. As a result, the offense was quiet the entire game, except for Ezekiel Elliott, who managed a quiet 87 yards on 18 carries. Push comes to shove, though, this week’s loss is an acceptable one, especially when considering that the Colts came into this match-up every bit as hot as the Cowboys did. All is not lost by any means, either: The Cowboys still have a better than 90 percent chance of making the playoffs this season, and with one more win in their remaining two games, they’ll clinch the NFC East division. That seems a given, if not at home against the beleaguered Tampa Bay Buccaneers next week, then when they finish the season on the road against the New York Giants. Here’s hoping this loss was just a bump in the road and this team can get back to its winning ways. Otherwise, the old, familiar calls to fire head coach Jason Garrett and everyone else on his staff will be revved up once again. But, hey, if you don’t make the playoffs with a greater than 90 percent chance of doing so heading into Week 16, maybe you deserve to be canned.